The coyote howler utilizes the coyote's active defense of his territory. By produceing realistic barks and howls, you'll quickly fool the wisest, wily coyote around. 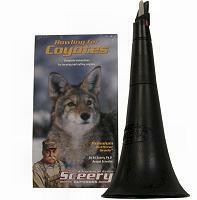 Ed Sceery's newly designed coyote howler kit now comes packaged with a 45 minute VHS instructional video, "Howling for Coyotes" that gets you started like a pro. U.S. Patent Pending. Totally New & Unique Sound. 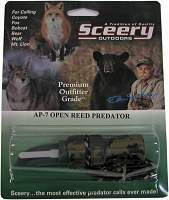 Double-Barrel Open Reed High Pitched Predator. Ed Sceery Personally developed these all new "Double-Barrel" calls. These calls are a totally new concept for great sounding game calls. Providing the hunter full control, extra volume, and fast action, they produce the most realistic 3-D sounds we've ever heard. Recommended for experienced hunters. Lanyard and instructions are included. U.S. Patent Pending. Totally New & Unique Sound. Double-Barrel Open Reed Low Pitched Predator. 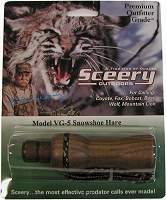 Ed Sceery Personally developed these all new "Double-Barrel" calls. These calls are a totally new concept for great sounding game calls. Providing the hunter full control, extra volume, and fast action, they produce the most realistic 3-D sounds we've ever heard. Recommended for experienced hunters. Lanyard and instructions are included. U.S. Patent Pending. Totally New & Unique Sound. Double-Barrel Open Reed Coyote Howler. 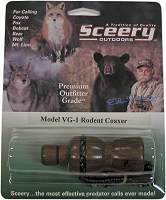 Ed Sceery Personally developed these all new "Double-Barrel" calls. These calls are a totally new concept for great sounding game calls. Providing the hunter full control, extra volume, and fast action, they produce the most realistic 3-D sounds we've ever heard. Recommended for experienced hunters. Lanyard and instructions are included. U.S. Patent Pending. Totally New & Unique Sound. 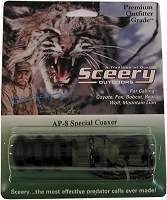 Double-Barrel Open Reed Predator Kit. 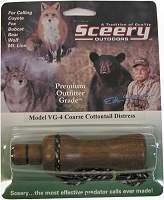 Ed Sceery Personally developed these all new "Double-Barrel" calls. These calls are a totally new concept for great sounding game calls. Providing the hunter full control, extra volume, and fast action, they produce the most realistic 3-D sounds we've ever heard. Recommended for experienced hunters. Lanyard and instructions are included. These are the finest tools-of-the-trade available anywhere! 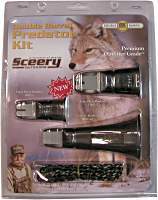 Go fully equipped on your next hunt with a regional set of Ed Sceery's patented, Cam-Arm predator calls. These are the top choice of government hunters in both the United States and Canada. Even the most call-shy varmint will respond to the authentic sounds of these expertly designed and carefully hand-tuned calls. Effective on all predators-coyote, fox, bobcat, wolf, mountain lion and bear. This kit comes complete with the AP-1 Rodent, the AP-2 Cottontail, the AP-4 Coarse Cottontail, and the PV-2 Predator Video. These are the finest tools-of-the-trade available anywhere! 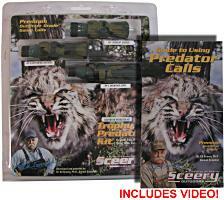 Go fully equipped on your next hunt with a regional set of Ed Sceery's patented, Cam-Arm predator calls. These are the top choice of government hunters in both the United States and Canada. Even the most call-shy varmint will respond to the authentic sounds of these expertly designed and carefully hand-tuned calls. Effective on all predators-coyote, fox, bobcat, wolf, mountain lion and bear. This kit comes complete with the AP-1 Rodent, the AP-2 Cottontail, the AP-3 Jackrabbit, and the PV-2 Predator Video. These are the finest tools-of-the-trade available anywhere! 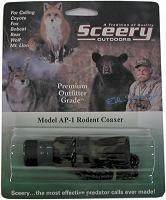 Go fully equipped on your next hunt with a regional set of Ed Sceery's patented, Cam-Arm predator calls. These are the top choice of government hunters in both the United States and Canada. Even the most call-shy varmint will respond to the authentic sounds of these expertly designed and carefully hand-tuned calls. Effective on all predators-coyote, fox, bobcat, wolf, mountain lion and bear. 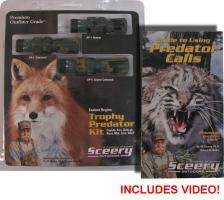 This kit comes complete with the AP-1 Rodent, the AP-2 Cottontail, the AP-5 Snowshoe Hare, and the PV-2 Predator Video. These are the finest tools-of-the-trade available anywhere! 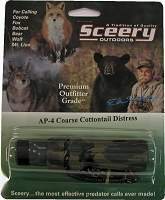 Go fully equipped on your next hunt with a regional set of Ed Sceery's patented, Cam-Arm predator calls. These are the top choice of government hunters in both the United States and Canada. Even the most call-shy varmint will respond to the authentic sounds of these expertly designed and carefully hand-tuned calls. Effective on all predators-coyote, fox, bobcat, wolf, mountain lion and bear. This kit comes complete with the AP-6 Variable, the AP-7 Open Reed, the AP-8 Special Coaxer, and the PV-2 Predator Video. Extra high-pitched for close range calling in forested and brushy areas. Excellent as a close-range call for fox and bobcats. Super for calling in wooded and brushy country where cottontail rabbits are found. Very effective throughout North America. The extra loud, jackrabbit distress is a long-range, coarse-voiced call that coyotes and larger predators can't resist. Developed especially for calling fox in the eastern United States, but very effective throughout North America. This call is for northern and high-country areas where the snowshoe hare is found. 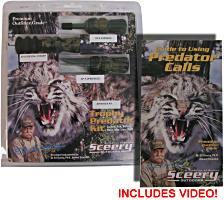 For the experienced predator caller who wants full control. A favorite among professional callers. 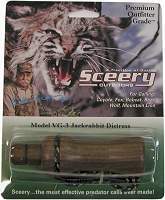 This open-reed call is especially designed for the extremely cold areas of the northern and mid-western United States. 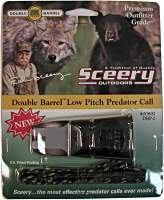 Predators find this hand-operated bellows call irresistible. A very effective close-range call. Extra high-pitched for close range calling in forested and brushy areas. 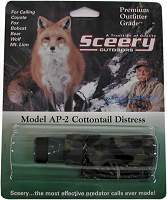 A great coaxer for coyotes and other small predators. 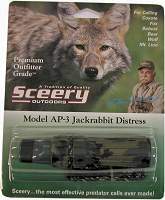 For calling in wooded and brushy country where cottontail rabbits are found. Very effective throughout North America. 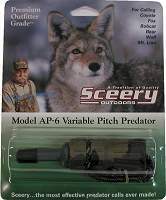 A long-range, coarse-voiced call that coyotes and larger predators can't resist. Developed especially for calling fox and bobcats in the eastern United States, but very effective throughout North America. A fine double-reed call. This call is for northern and high-country areas where the snowshoe hare is found. Equipped with a double reed for great tone control. 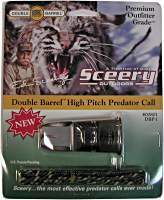 A detailed and comprehensive instructional review of Ed Sceery's own predator hunting and calling techniques. You'll get 30 years of top hunting experience and tips by North America's top predator hunter. (55-minute VHS video). 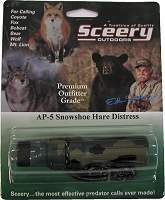 Ed Sceery reviews how to blow and operate different styles of predator calls for best field results. (30-minute VHS video). Ed demonstrates his techniques for howling and takes you into the field to see, hear and hunt coyotes. (55-minute VHS video).